The 10th Berlin Biennial takes inspiration from the interchangeability of the numeral X with the letter X, taking as its starting point the ambiguity created through multiplicity. X signifying an unknown variable in mathematics or the unsolved case within criminology, X marking the undisclosed location, X the kiss or X the act of negation and erasure, X as the starting point for re-drafting the text. The ambiguity of the number/letter X forms the foundation of a biennial which refuses to be defined by a singular theme. The ground floor of the KW Institute is dominated by Dineo Seshee Bopape’s installation Untitled (Of Occult Instability) [Feelings] 2016-18. The exhibition space has the feeling of being undone, as its architectural space is disrupted by pillars lying out across the floor, pillars which mirror those existing horizontals, now uprooted amongst piles of rubble. The multiple reference points within Bopape’s installation are tangible, yet there is a feeling that anything might happen as ideas have been uprooted and redistributed but are yet to settle. Lachell Workman’s Justice for ______, 2014 is a direct statement of this process of re-writing. The installation draws its references from literature, history and music, a particular source being Bessie Head’s novel A Question of Power (1974) about a woman’s descent into madness. The room is immersed in an orange hue in reference Nina Simone’s 1976 performance of Feelings at the Montreux Jazz Festival, which plays on a monitor within the space. Other videos on the floor offer a window into nature, depicting a walk though parkland. The monumentality of the ruined pillars and the buckets filling with dripping water suggest fountains within an artificially ruined landscape, one which references existing spaces but exists largely within the mind. The landscapes on the floor depict the Bois de Vincennes Park, a space which was once occupied by human zoos as part of the Paris Colonial Exposition, such referents interrogate the neutrality of the picturesque landscape we see on the screen and ask the viewer to work harder. 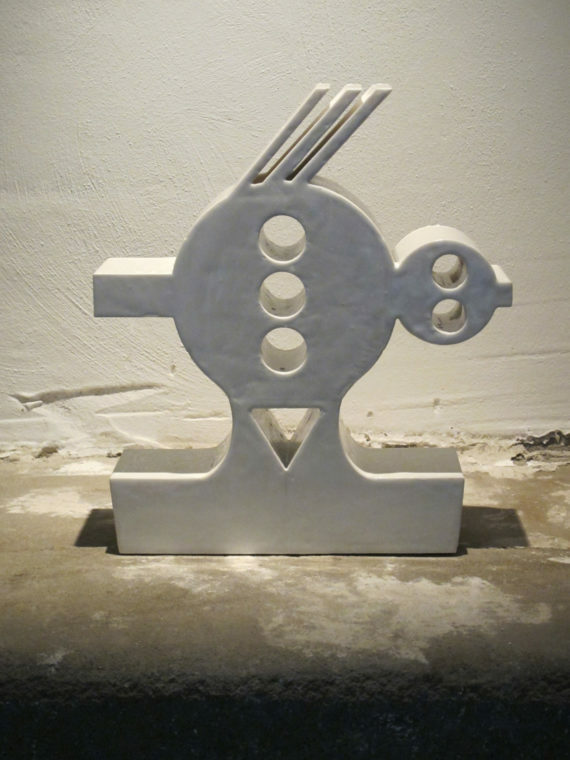 The installation also included works by the artists Jabu Arnell, Lachell Workman and Robert Rhee who Bopape had invited to be part of the work. I was particularly struck by Occupations of Uninhabited Space (2013 – ongoing) the gourd sculptures by Robert Rhee, these distorted, phallic forms were created using vegetables which had been forced to grow within an enclosed steel framework, the form they would eventually take on defined by the existing steel boundary (not yet encountered). This work seemed to be a metaphor for the structures that the installation was intent on unmaking. On another floor of the KW is a film by Natasha A. Kelly which documents several artists, who are each sharing aspects of their own biography and how this relates to their experience as Black female artists. Kelly’s film is titled Milli’s Awakening (2018) in reaction to Ernst Ludwig Kirchner’s painting Sleeping Milli (1911) which is synonymous with the reductive representation of Black women in Western art history. In turn, the artists interviewed by Kelly explain through stories of their own experience how they self-define and how their work is defined by others. Work becomes inherently politicised within an environment where the only figure granted neutrality is the white male artist. Within this framework everyone else is necessarily non-neutral, their work perceived to be operating from a particular subject position. Work grows within the confines of the steel frame (encountered/not yet encountered) or it operates outside the frame where it may develop freely but will always be encountered as something beyond the bounds of current definitions. The way that art and activism became necessarily intertwined in these stories is something that really resonated with me, as a group of us had recently come together to form Grand Union (GU) Women a grassroots group and peer support network with the purpose of championing women in the arts through self-organisation and working together, rather than focussing on competing with each other for the small percentage of opportunities available to women within the current system. The dazzle pattern designed for the Berlin Biennial by Maziyar Pahlevan is further evidence of the desire to disrupt the simplicity of existing narratives and embrace the possibilities presented by complex subjectivities. Dazzle pattern or zebrage is a method of camouflage which does not use tactics of concealment or mimicry in order to assimilate the existing environment. Instead of adopting tactics designed to diminish visibility, dazzle was a designed to “confuse rather than conceal”, to distort perspective and make it impossible for submarines targeting the dazzle ships to predict which direction they would take. Continuing with the theme of design strategies, the ZK/U Centre for Art and Urbanistics presented several works which challenged the construction of ideologies and examined how ideas are made visible through the media. 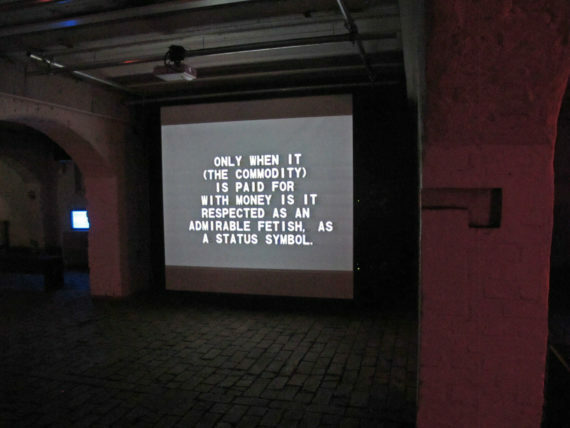 In his installation Tony Cokes presents us with the word uncoupled from the image, through this isolation the power of the image to distort is acknowledged, but what Cokes is also preposing is the re-articulation of received ideas and the inherent possibility in the texts once they become un-tethered and allowed to move freely. The texts flash up in different colours in the basement which feels like a club, music and text alternate rhythmically as ideas are imbued with emotive expression or pared back to simple statements independent of their original context. 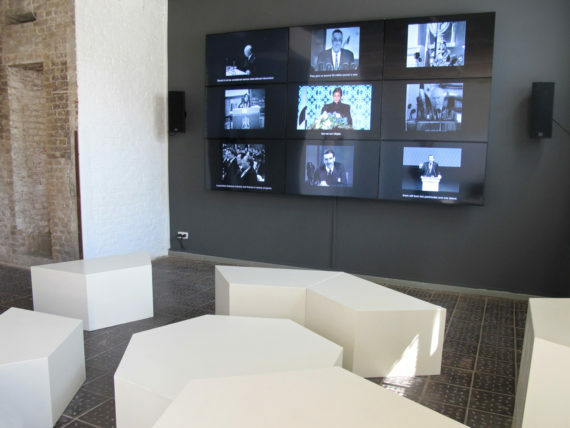 The installation fuses diverse sources from Morrissey to the Situationist international, interspersing texts with newsreel footage from the Watts riots to propose an alternative reading. 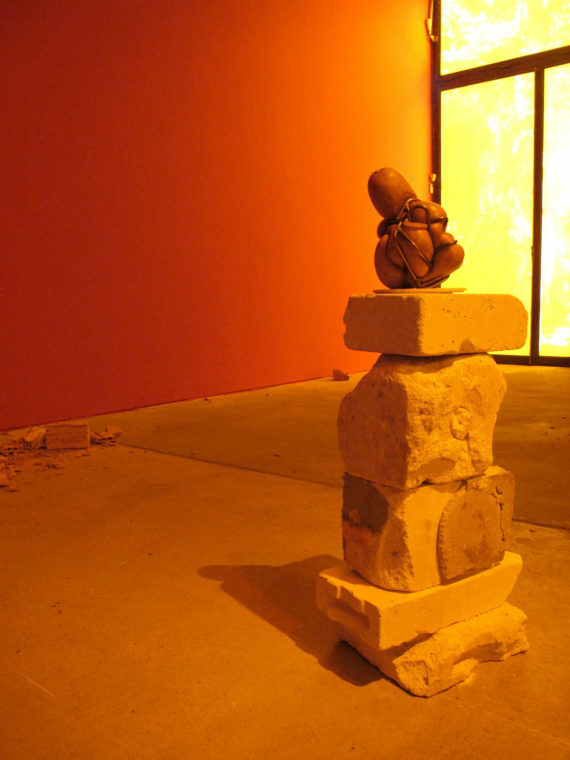 Tony Cokes’ work deals in the re-construction and examination of existing ideologies, as does the work of Heba Y. Amin also on show at the ZK/U Centre. Amin’s work takes strength from the multitude of past (failed) ideologies and revels in the ridiculousness of past ventures as they are received in the present – proposing the creation of a new supercontinent. The Anti-Control Room (2018) is part of a larger project Operation Sunken Sea which explores the idea of creating a supercontinent ‘Atlantropia’ through draining the Mediterranean Sea. In contemporary discourse on the future, ‘the future’ has ceased to be something that you expect to be different, it has become a retro concept, but “Retro, compared to what?” is the question posed by Mark Fisher in his lecture on ‘The Slow Cancellation of the Future’. “What is it to be in the 21st Century? he asks, “It is to have 20th Century culture on higher definition screens.” The accessibility of the past in the present, particularly through the internet means that the past is always with us. In this cultural environment there is a distance and impossibility about the idea of developing new utopias or expressions of the future that are free from irony. However, Tony Cokes and Heba Y. Amin utilise this material, overwriting received ideas to form their own commentaries. Heba Y Amin’s installation deals with the weight of history (in the age of the internet) head on, as we see historic speeches by Mussolini, Gaddafi or Anthony Eden on the Suez Canal displayed alongside Amin’s new fictional utopia about the draining of the Mediterranean Sea and the creation of a new supercontinent. These past ideas increasingly display their flaws and the weight of their existence does not make imagining a new utopia seem impossible, instead through Amin’s positioning the imperfections are made apparent and in turn make the idea of utopia seem more tangible, within the grasp of the present.